Twenty-year-old Ahaz was just like the wicked Kings of Israel - no regard for the one true God. He even sacrificed his children on the pagan altar and rebuilt the altars to Baal. God abandons him because of his evilness. Syria and Israel (Northern Kingdom under King Pekah) team up against Judah (II King 15:37, see notes). First, King Resin of Syria comes after him and defeats him. Then it's his distant relatives from Israel who come and whip up on Judah - even take 200,000 prisoners to serve as slaves, but God speaks through the prophet, Oded, and makes Israel give them back. Then the Edomites attack...and the Philistines too. What's a king to do? Against the counsel of Isaiah (Isaiah 7, see notes), Ahaz sends to Tiglathpileser of Assyria for help. He pays for this mercenary help by taking treasures from the temple. The problem is that Assyria doesn't actually help to any large degree. They do attack and beat the Syrians, but little more. When Ahaz makes his trip to Damascus, Syria after King Tiglathpileser of Assyria had taken that city, he is impressed with the Syrian gods he sees there. Never mind that those gods had not protected Syria from defeat against Assyria. He sends orders back to Jerusalem to the high priest, Urijah, to build an altar like the one in Syria. After some remodeling in Solomon's temple, they make way for a new kind of worship throughout Judah. Ahaz finally dies after a miserable 16-year reign; while he is buried where his ancestors were buried, they don't bury him in the same tomb with the other kings; he's just not worthy. Here's the rest of the story on the damage done by Ahaz. Certainly...the Northern Kingdom (Israel) had abused Ahaz. However, Isaiah promised Ahaz deliverance without the assistance of Tiglathpileser of Assyria (Isaiah 7, see notes). By inviting Assyria into the region for his protection, he actually facilitated the Assyrians in their move against the entire region. Subsequently, Assyria conquers and deports three and one-half of the tribes of Israel to Assyria in 733 B.C. (II Kings 15:29, see notes), followed by the remaining tribes eleven years later (II Kings 17:6, see below), and eventually, in 701 B.C., to bring about Judahs own devastation by the armies of Sennacherib (II Kings 18:13-19:37; II Chronicles 32:9-22; Isaiah 36-37, see notes). After that assault upon Judah, only Jerusalem remained unclaimed by Assyria...but only after a miracle from God himself. As you can see, Ahaz did a great deal of damage during his short reign as King of Judah. II Kings 16:2-4 Twenty years old was Ahaz when he began to reign, and reigned sixteen years in Jerusalem, and did not that which was right in the sight of the LORD his God, like David his father. But he walked in the way of the kings of Israel, yea, and made his son to pass through the fire, according to the abominations of the heathen, whom the LORD cast out from before the children of Israel. And he sacrificed and burnt incense in the high places, and on the hills, and under every green tree. II Chronicles 28:1-4 Ahaz was twenty years old when he began to reign, and he reigned sixteen years in Jerusalem: but he did not that which was right in the sight of the LORD, like David his father: For he walked in the ways of the kings of Israel, and made also molten images for Baalim. Moreover he burnt incense in the valley of the son of Hinnom, and burnt his children in the fire, after the abominations of the heathen whom the LORD had cast out before the children of Israel. He sacrificed also and burnt incense in the high places, and on the hills, and under every green tree. The wicked King of Israel, Hoshea, paid off the King of Assyria (Shalmaneser V, son and successor to Tiglathpileser III), not to attack. However, it all fell through when Hoshea double crossed him by working another deal with So, the King of Egypt - a bad deal which landed King Hoshea in an Assyrian prison. Assyria subsequently came in and captured the Northern Kingdom in 721/722 B.C. So, Hoshea has the distinction of being the last king of the Northern Kingdom also known as Israel. II Kings 17:2 And he did that which was evil in the sight of the LORD, but not as the kings of Israel that were before him. 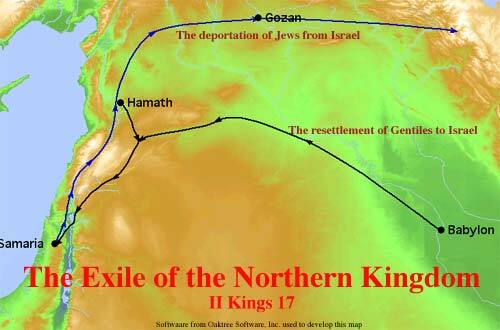 Israelites were deported out of Samaria into greater Assyria. Why? It destroys national pride - makes it easier to control the masses. When you're running an empire, that's important. A discourse is found here outlining why Israel fell (worship of pagan gods, verses 7-12), despite warnings from God's prophets (verse 13). However, they continued with their rejection of God (verses 14-17), until we see a sobering verse 18, "Therefore the LORD was very angry with Israel, and removed them out of his sight: there was none left but the tribe of Judah only." Judah is still intact at this point, but we see in verse 19 that they don't lag far behind Israel in their wickedness. Then, beginning in verse 20, you will notice that Jeroboam, the first King of Israel after the reign of Solomon, gets the credit for corrupting Israel beyond repair. He set up calf worship from the very beginning, and Israel never served God from that point until their fall to the Assyrians. To finish off the task, the Assyrians bring foreigners in to populate Israel since many of the Israelites had been deported. The Assyrians had a little problem, though; the new people weren't familiar with the religious practices in Samaria (WHAT RELIGIOUS PRACTICES?). Interestingly enough, this results in attacks by lions which the King of Assyria attributes to the new inhabitants' lack of familiarity with Israel's God. So they send back to where the Israelites had been deported for a Samaritan priest to provide orientation for the new inhabitants of Israel. So, the corrupted practices of religion instituted by Jeroboam became one of the many religions of the Assyrian Empire in Israel...with a sprinkling of Jehovah worship added into the mix. Why did Israel fall? They did not follow the one true God. This record continues in II Kings 18 (see notes).